The McCarter production would seem to be the novelty here: Beaumarchais’s play (1778) isn’t performed very often in the US, and I’d never seen it before, though I have read it. It was an ambitious undertaking for this regional theater, performed in rotation with Barber of Seville, premiering new adaptation by Stephen Wadsworth (highly colloquial but only occasionally anachronistic), who also directed. Wadsworth has much experience in opera, one of the actors was a singer (Naomi O’Connell, the Countess, her day job made obvious by her formal, regal bearing and the rather unvaried use of her [speaking] voice), and most of the audience, like me, spent most of the performance comparing the play to the opera. Of the two plays, I found Barber more convincing: once you wind up a good farce, it’s hard to screw up, with singing or without. The play version has a few extra twists, to boot, and Charles Corcoran’s two-level set was used to great advantage. We find out a lot more about the characters and Figaro in particular is way more interesting. But as a text, Marriage is a more multifaceted, ambiguous thing, as is Mozart’s opera compared to Rossini’s. Mozart’s delineation of character and range of expression—as well as the sense of timing conferred by a score—was sorely missed. Wadsworth’s tone tends toward juvenile, hokey humor (everyone keeps saying “they’re meeting behind the CHEST… NUTS” over and over in case someone didn’t get it) and only occasionally touched on the deeper notes of pathos which Mozart strikes along with the comedy. While the drama, particularly in the first two acts, proceeds in just about exactly the same order, with some lines even echoing the opera (I’m not sure which direction this went in), you are even more conscious of the enormous contribution of the score. The greatest loss is the Act 2 finale, which in Mozart is one of the greatest miracles of music and in this production is just an action-packed finale. Yet Wadsworth is, as a director, very conservative. The production is slick, inoffensive, and conforms to all our modern expectations about what a tasteful, “fun” period production should look and sound like (this is typical of McCarter’s productions in general). In its skillful, polished, always slightly wiseass delivery, it assures us that we are in on the joke, not the victims of it, and that nothing untoward or dangerous will occur. Despite the explosive rhetoric, it’s hard to believe that Wadsworth would ever be found atop any barricade, ever. Whatever plea Figaro makes for the working class, Wadsworth’s production speaks to not the triumph of the working class but of the middle. It is quintessentially, and I wouldn’t use this word if I didn’t really think there isn’t anything better, bourgeois. The audience can leave the theater content, because they are neither oppressor nor oppressed. David McVicar may be an unconvincing candidate for a radical, and the Royal Opera House of today a poor site for a revolution, but in comparison his Figaro never neglects class consciousness. (I must add: only in comparison.) This is achieved even despite a tone which is largely light and comic, which the audience evidently found very funny. Yet the undercurrent of discontent, while restrained, never really ceases until the end. The setting is moved to the Regency period, a somewhat odd decision which removes the French revolution from the horizon and seems to me to speak to specific developments in British history—reinforced by the fact that the visuals are more Jane Austen than Spain. Chartists never did storm the Tower of London, but the opera is less explicit in its condemnation of the nobility than the play. This production is available on DVD. 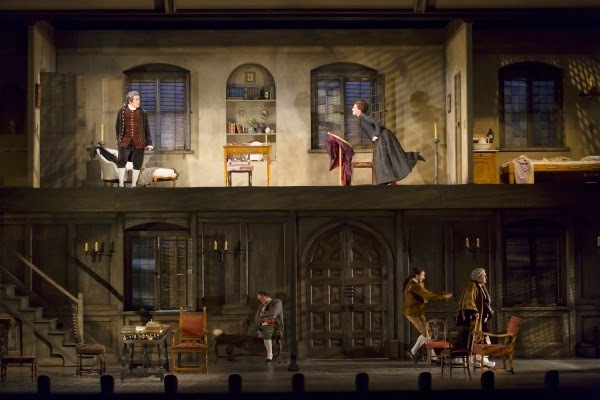 The trappings of McVicar’s production emphasize the hierarchies of the Count’s household (the pale color palette is rather early-nineteenth Restoration Hardware, and it and the lighting are more elegant than McCarter’s brighter look). The first act takes place in a small room located within the frame of a much grander house space (not pictured, sorry). This is fitting because Figaro and Susannah’s new bedroom is hardly suited to occupy a full large stage, and the contrast between the dingy interior and the neighboring hall’s windowed airiness could not be more clear. The hallway also allows the production to illustrate the larger workings of the household as we see many, many of Susannah and Figaro’s co-workers at their labors. Simultaneously, we witness the household’s utter lack of privacy; we see everyone coming and going, and occasionally listening in. All in all it is quite smart. Yet neither is this anything too unconventional, and we get the expected Figaro moves: the Count’s boots in “Se vuol ballare,” and the prototypical Figaro gesture of the fist slamming into the palm to denote a missing seal—Wadsworth has this latter one too. (If someone were to walk up to me on the street and make this gesture, I would probably say, “Figaro, Act 2 finale.”) McVicar treads a fine line between detailed and cluttered, but mostly comes out on the detailed side of it. As performances of the opera go, this was good but not triumphant, marred by David Syrus’s pedestrian and coordination-challenged conducting. While the orchestra sounded fine, and as Mozart goes old-fashioned, pit-stage relations were at times almost as bad as servant-master ones, and the two parted ways entirely at the end of Bartolo’s aria. The cast nonetheless featured several strong performances: Gerald Finley again distinguished himself as an sinuous Count, and since he’s one of the only baritones who can actually make the impossible Act 3 aria into a star turn it seemed a shame to strew superfluous stage action all around him. Alex Esposito’s Figaro was appealingly natural, angry and yet still charming, and sung with smooth ease. 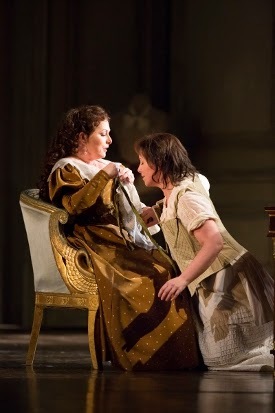 Anna Bonitatibus has grown as Cherubino since I last saw her and now commands a much more expressive Mozartian line, her tone still fruity and colorful. She’s also really funny, a fine actress. Camilla Tilling was a good Susanna, sung with a pretty and silvery tone. The weakest link was Rebecca Evans’s lightweight Countess. While she has a sure technique, her tone is unglamorous and sometimes hollow, and her acting was cheery and unburdened, too cutesy by half. Among the supporting characters, Maria McLaughlin was an amusing Marcellina. 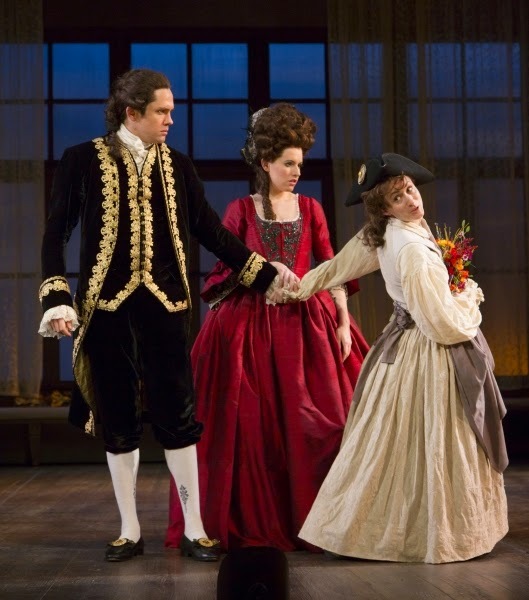 In the McCarter production of both plays, Rosina/Countess emerged as the central figure, an aristocrat reduced to modest captivity and then, after considerable tribulations, finally back on top. Had the theater as planned also produced the third play, The Guilty Mother, this may have made a full arc, but as it was we were left with a restoration of sorts. Despite Figaro’s long monologues and incomparably colorful backstory (and even the rubric under which these productions were promoted as The Figaro Plays), he is not allowed this same sort of development or progress; this is the very point he makes in that monologue. And in Mozart, the Count-Countess relationship is the one which receives musical and dramatic precedence at the opera’s end. McVicar is a clever director and knows how to end with a striking image, here an anonymous cleaning woman who finally takes center stage in the final bars. But it hasn’t been her opera, and it couldn’t be. As a dramatic move it’s a bit of a cheap shot in comparison with the more complex action which preceded it–a complexity which is not only McVicar’s but also Mozart’s and Da Ponte’s. In comparison, Wadsworth ends his production with an extended dance, a production number which seems less a restoration of order and harmony than a last salvo at providing some entertainment. It was, after all, only the folly of a single day. The Figaro Plays: May 2 and 3, McCarter Theatre, Princeton. 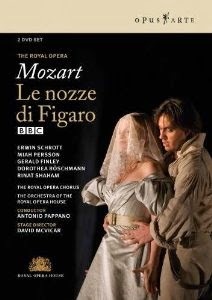 Le nozze di Figaro: May 15, Royal Opera House, London. Photos copyright McCarter Theatre/T. Charles Erickson and Royal Opera House/Mark Douet.